Should Hetch Hetchy be submerged for a reservoir, as proposed, not only would it be utterly destroyed, but the sublime canyon way to the heart of the High Sierra would be hopelessly blocked and the great camping ground, as the watershed of a city drinking system, virtually would be closed to the public John Muir (Muir 1912: 259) Hetch Hetchy Dam, which flooded a valley as wonderful as Yosemite to supply San Francisco, most certainly would not be approved today [and the Sierra Club is pressing for removal of the dam]. It destroyed a valley and led to the above complaint from the founder of America's national parks. In Britain too, the main reason for building dams has been to store water for domestic supply. Public health considerations once provided a reason for restricting other uses, but water can now be purified. Many American dams, though built for flood control, were also built as single-use projects. There is a plaque on a reservoir outside Miami which reminds visitors that 'The dams of the Miami Conservancy District are for flood prevention purposes. Their use for power development or for storage would be a menace to the cities below' (Thorn 1966: 265). Britain has had few needs for new reservoirs since the 1980s (Pearce 1981), but it has a great opportunity to convert old singleï¾­purpose reservoirs into multiï¾­functional landscapes [Fig 5.1]. 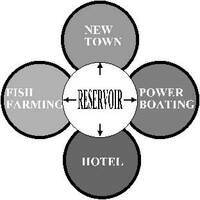 Before examining this potential, let us explore the history of reservoir single-purposism and the principles of EID for reservoirs. 5.1 Old reservoirs can contribute to new functions Nineteenth century doctors discovered that the spread of cholera, typhoid and other infectious diseases, could be controlled by a supply of clean water and hygienic disposal of sewage. The public developed a thirst for pure water and, since the process of waterï¾­treatment was imperfectly understood, British suppliers adopted every measure to protect their sources. Where possible, they obtained water from uninhabited uplands. These 'gathering grounds' were purchased and fenced to prevent public access. Commoners' rights were extinguished (Hoskins & Dudley Stamp 1963: 84). Suppliers aimed for 'a state of neatness and polish... beyond what is of direct practical utility (Ministry of Health 1948: 12). Farmers were evicted from gathering grounds. The public often complained about 'the depressing influence of ruins', which were once 'thriving farmsteads'. In 1943 the fifth edition of a textbook on The examination of waters and water supplies stated that 'land adjacent to reservoirs, and the banks of feeders, should not be cultivated' and 'Footpaths or highways along the banks of reservoirs are objectionable, since they permit many forms of wilful or accidental pollution' (Suckling 1943: 33). In fact, the incidence of cholera and typhoid in Europe declined rapidly after discovery of their causes. Britain had its last cholera outbreak in 1866. Typhoid was more difficult to control but the incidence declined from an average of 320 cases per year, between 1871 and 1880, to one case only in the year 1940. There was however a serious outbreak of typhoid at Croydon in 1937ï¾­8 which reinforced the authorities' caution (Ministry of Health 1948: 7). The water industry's high standards, and automated quality control, now offer every prospect of clean water supplies being scrupulously maintained. When the risk of serious disease being transmitted in drinking water had vanished, the water undertakers began, with the utmost caution, to consider the possibility that a few clean members of the public might have occasional access. The Bristol Waterworks Company was the most enlightened supplier. It was the first to permit trout fishing, at Blagdon reservoir in 1904. It was the first to permit sailing, at Cheddar reservoir in 1947. It was the first to design a new reservoir with recreational facilities, at Chew Valley in 1956 [Fig 5.2]. In 1963 the Durham County Water Board still required 'a certificate from applicants who must show that they are not typhoidï¾­carriers before permitting even a small amount of camping on their gathering grounds' (Institution of Water Engineers 1963).